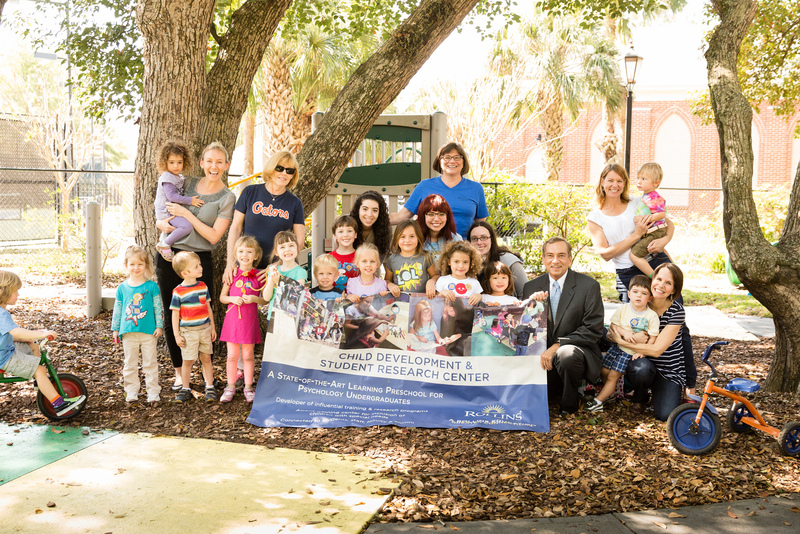 Rollins College President Lewis Duncan joins children at Rollins College Child Development & Student Research Center (CDC). Rollins College Child Development & Student Research Center (CDC) and the Rollins Office of Community Engagement collected 127 sweaters for the Early Learning Coalition of Orange County and the Coalition for the Homeless through the college’s sweater drive to honor what would have been Rollins’ alumnus Fred Rogers’ 86th birthday on March 20. Rogers, who was the producer and host of the well-known PBS show Mister Rogers’ Neighborhood, graduated from Rollins in 1951 with a bachelor’s degree in music composition before moving on to his television and communications career. “Mr. 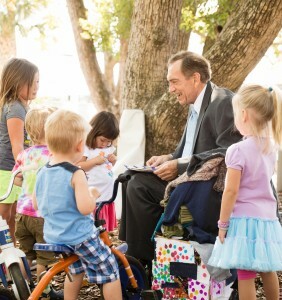 Rogers’ messages are as meaningful to adults as they are to children, and remain as significant today as they were 40 years ago when Mister Rogers’ Neighborhood first aired,” said Rollins College President Lewis Duncan. The annual Mr. Rogers’ Neighborhood Sweater Drive brought in 127 sweater donations for the Early Learning Coalition of Orange County and the Coalition for the Homeless.